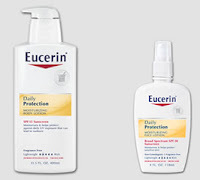 FREE Eucerin Daily Protection Moisturizing Body & Face Lotion Samples! Head over to Eucerin's Facebook page to request free samples of their Daily Protection Moisturizing Body and Face Lotions! You'll need to take a pledge (fill out a form) to get them.